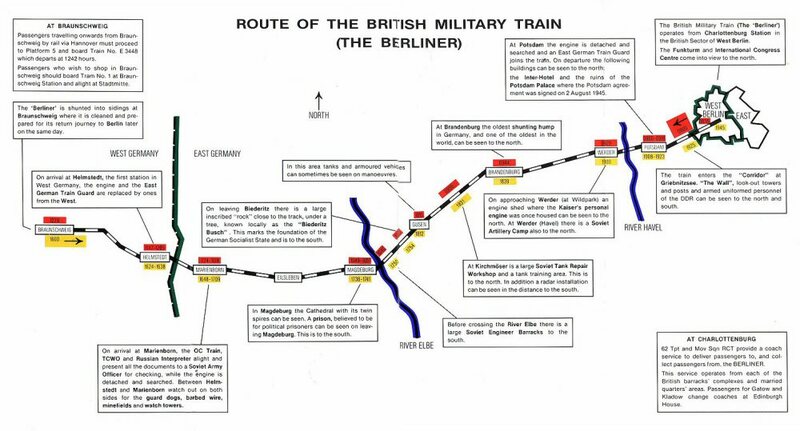 The map shown below was provided for every passenger on the Berliner, and highlights the timings, events and various sites of interest along the route between Braunschweig and West Berlin. Although the exact timings varied over the many years the service was in operation, the timetable information provided below relates to the later years of the service. The long dwell times at Potsdam and Marienborn were necessary for completing passport checks and detaching, searching and re-attaching the locomotive; whereas at Helmstedt the time was needed to change locomotives.